The rules state that the game ends when the last card is drawn. In my experience, especially with more casual players, no one wants the game to end while they still have cards in their hands. In our games, we continue playing until a player has no cards left in their hand. Initially there was a fear that as you get fewer cards, the storyteller’s card would become more obvious, but this doesn’t seem to be the case. If anything, people become more creative with their last card. (We’ve yet to have everyone guess correctly or incorrectly on the final card, even though you generally have no choice what to throw in). We continue keeping score until the end (but in our games, people stop caring about score and are just enjoying the game by the halfway point). “The storyteller” that is your name while you figure out something to say about the beautiful, interesting and sometimes puzzling cards that you have been given. And while you are describing your amazing tale you want to be picked, but not by everyone, so what do you do? One great thing the illustrator of the cards has done with this game is make every card capable of being a story, with a multitude of different things going on. My first time playing this game after becoming the storyteller was a challenge, figuring out what to say for my cards, it was a challenge! Then a ray of light, I started noticing all the detail on the card and many of the cards have small, little detail that most people will easily overlook. After noticing that I started to give a clue to the smaller items on the card, and behold I would win! I would have a 1 or 2 people pick my card while 1 or 2 people wouldn’t, because they didn’t take the time to look closely at the card. I rejoiced victory never tasted so sweet! Trying giving a clue for something small in the picture, just be careful not to do it for every card or they just might catch on! This is my secret I have shared with you, so you might also taste the sweet nectar of success. Your turn as the storyteller? Take your number counters, which aren’t being used, and lay them out facing the other players. Then when you lay out the cards, put one under each number. That way there is no confusion about which number goes with which card. Pro tip: If you take forever as the storyteller, have the 8 year old lay out your numbers for you. Keep the little ones engaged! A great variant I use of is to pair off. Two people use one rabbit. Sitting across from your partner and trying to let them guess your card allows for more people to play and a slightly faster experience. In most of my games, the phrases that separate the most notable rounds from the ones we forget are the phrases that tend to be longer. You may be tempted to use a phrase like “Darkness”, or “Happy thoughts” for whatever reason, but try to flush out those one- or two-word phrases into something more robust and interpretable. These phrases will often be loaded, and you’ll end up with a much more diverse group of cards to pick from. When you are playing with fewer then four players add 1 card blind from the deck to give an extra card to choose from when making your decision. this worked about half the time. with 2 players choosing from 4 cards it makes a better game then choosing from 3 cards. The extra card actually matched the clue about 1 in 4 times. When it didn’t match it was so far off that it didn’t affect play but added a fun challenge to the game. 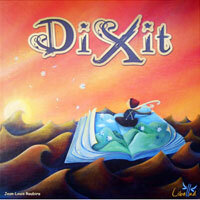 In order to use this rule you need Dixit 2 for extra cards, and you need to make your own tokens (number of players plus one token). We add one additional card for each player (15 cards per person total). If you play with more than 6… no problem (just get a meeple for the scoring track). Now, we have an additional card each player gets that will allow them to place down two cards during one turn (and one turn only). The first person to do this in clockwise order from the storyteller effectively ends anyone else from doing this in the turn. If you want to have more opportunities… add more cards per person. This has added a little twist to our games, as sometimes you start figuring out what people are doing, and it’s nice to throw in a curve ball. Also, it allows you to get rid of that card that just doesn’t seem to fit anything at all… and sometimes it gets you points! Proof that one person’s junk is another person’s perfect visual clue. Even if you’re a bad artist it is super funny to see the wacky creations that come out. Have all the players make as many as they can and then randomly deal them out. Save the best cards for future use or just for a good laugh. It works best if you use index cards to keep it consistent. People can get stuck trying to figure out a clue when it’s their turn during a round. The rulebook suggests to let anyone who’s ready take the next turn — whoever calls it first. This really speeds things up. Figure out some kind of marker to show who’s taken a turn each round so everyone gets a turn before the next round starts. You can add more people to the game by limiting the number who play cards each hand to 5 (plus the storyteller’s card), i.e., the additional players (7th, 8th, etc.) don’t get to play a card for voting. Just rotate the players who sit out each turn to keep things fair. Everyone still votes (you’ll need to make extra markers) and play proceeds as normal. Playing this way is not as awkward as it might sound and it’s a really nice option when a 7th person shows up and no one wants to sit out the entire game. Do a round or all sounds to describe your card! It’s hard to guess but hilarious to behold! For a special challenge you can try limiting everybody’s clues to a particular theme like “Star Wars” or “Song Lyrics”. You’ll be amazed what you can come up with with a few restrictions! Instead of stopping play when the last card is drawn either stop play when someone reaches 30 points (the end of the score track) or once everyone has been the story teller X number of times.